I’m not going to give an account of our movements every day, fells bagged etc because @hillplodder has already done that much more eloquently than I can. This is more a reflection on what I’ve seen during the trip and how it’s affected my perception of the Lake District. 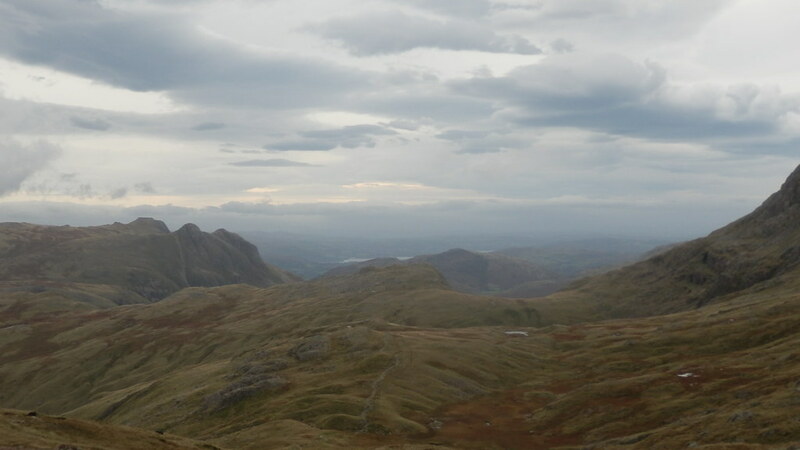 The route that he’d planned for this trip was, according to @hillplodder ‘Unashamedly chosen to make you love the lakes’. So no pressure, then. I’ve only been to the lakes twice before, once in 1997 and last year on a family holiday to Kirkby Lonsdale. The high points of the first trip (to an unspecified lakeland tarn) were my first pint of Bluebird Ale, and a rather dubious offer from my friend Geordie that myself and his wife might fancy a quick skinny dip in the tarn with him. Hardly an auspicious start for a love affair with the Lake District. What struck me as we left the train at Windermere were the colours. The grey buildings of local stone, the trees starting to turn to gold, russett and brown. At Grasmere, on the ascent up to our first camp at Codale, more colours. The blue of distant fells, the bulk of dark looming peaks and the burnt orange of the dying bracken stark against the green of the valley grass. It was almost dark as we approached Codale, the sound of the tarn lapping gently against the shore. As night descended and the wind got up, the cloud started to disperse, like ghostly fingers parting to reveal the moon reflecting on the black inkiness of the tarn waters. Above our heads in the blackness of the sky the stars blazed in a way that I’d not noticed before. I drifted off into an uneasy slumber lulled by the sound of the chattering beck. I was beginning to really feel this place. The following morning things had changed again. The call of unfamiliar birds, and watching the sky turn from pink to gold as the dawn arrived. As we neared the top of Sergeant Man rocky boulders littered the way, the short moorland grass cropped low by the sheep. Shafts of sunlight penetrated the clouds and illuminated great swathes of moorland with an almost ethereal light. At Thunacar Knott the landscape took on an almost extra – terrestrial feel, with boulders scattered as though by some careless giant. As we walked over to Angle tarn I noticed Pike of Stickle pointing suggestively at the skies, protectively guarding the side of the Langdale Valley. The unwordly feeling continued as we attempted to locate our second camp at Sprinkling tarn. As the white mist swirled around us, glimpses of the bulky mass of fells slid in and out view. At last there was the grey surface of the tarn, ruffled by the wind and broken intermittently by the spikes of the dying bullrushes. No moon and stars awaited us tonight. Just the damp presence of the mist, cloying and suffocating. We could have been anywhere in the world, the only clues to our location being the sighing of the wind in the tent guys, and the steady lap of the tarn waters against the shore. The world had changed again after the long autumn night, gone was the mist of the day before, and in its place a sky showing the first flushes of the colours of dawn. As I gazed at the kaleidoscope sky I felt a pang of sadness as this was to be the start of our journey home. As we headed across Esk Hause the iconic views eclipsed by yesterdays mist magically slid into view, making me want to sit down and catch my breath. During our slow descent down into the Langdale valley the harsh moorland landscape softened almost imperceptibly, blending into the deep greens and golds of the valley in autumn. We traversed Mickleden Beck, making its way noisily down to the valley bottom, still full from the rains of the past week. The atmosphere changed around us as we descended deeper, the harsh calls of the moorland birds of prey returning to the more familiar sound of birdsong. As we approached the whitewashed stone of the Old Dungeon Gill I felt sad that my first wildcamp weekend was over so soon, but excited too that it was hopefully to be the first of many such adventures in the Lake District. Great read you should start your own blog, you should (if you haven’t already) read AW’s write ups, they seemed very similar to your account. Nice piccys whoever took them and another great blog!